If there are three things in the world that I love besides my family (kids, husband, parents, et al, right? ), they are video games and Nathan Fillion. If you’re even mildly into geek/nerd culture, then you’ll recall your first moment crushing on him. Was it Dr. Horrible? Was it Firefly? Did you threaten to annihilate the world/Fox network when they canceled Firefly? This is stuff you don’t mess with. These are the cultural milestones you remember in your brief existence. It doesn’t matter if you’re a guy who’s turned on by beautiful women in the SI swimsuit edition or if you’re a woman that more than anything appreciates her corner office and fantasizes about a pair of red high heels spotted in the Bloomingdale’s window. Everyone swoons when Nathan Fillion walks into the room. Or when he speaks. Or when he tweets. Shush now. It’s the truth. So imagine how phenomenal it was to log into Destiny 1 and bump into Cayde-6, the Hunter Vanguard exo (robot), and from his robotic jaw drops the voice of none other than NATHAN-FREAKING-FILLION. 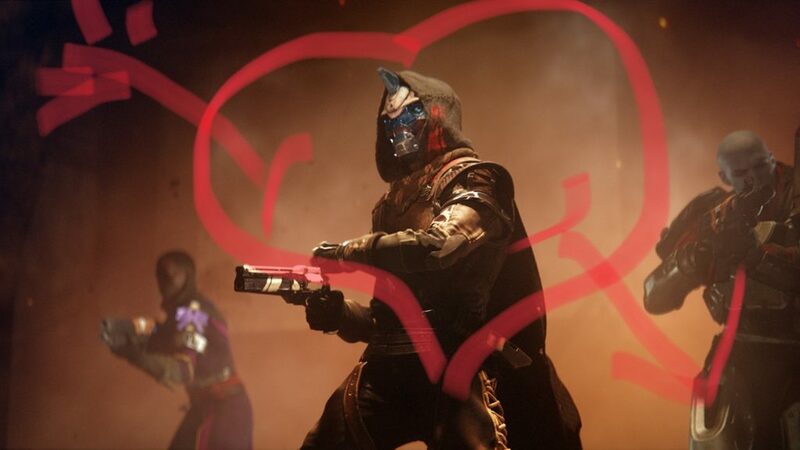 I don't remember seeing the heart in the original trailers. But it fits. So I'm gonna leave it. It was love at first sound-byte. Anyway. I had other fish to fry. In my life. You know. Having babies. Raising babies. Writing books. Shiz like that. The one redeeming trait of even the initial launch of Destiny was, oh, how’d you guess, Nathan Fillion. And he’s just gotten better. Right? As the game has progressed (I went back to D1 in January of 2017), Bungie has continued to shell out the big bucks to keep Nathan Fillion (idiotically, however, they dumped Peter Freaking Dinklage, who lent a sort of gravitas to your Ghost–which, thinking of it, was a nice foil to Cayde-6 and his goofiness) returning. And now. And now there is Destiny 2. I have issues with some things, yes, like who designed the Vault? I hate my vault. I need to be able to sort by power level and gun type, but nope. So guess what’s still necessary? A third party app that allows me to sort by gun type and power level. And does it bug you as well that you can’t choose what type of PVP to play? It’s always an annoying gamble! Especially in the Competitive list, which consists entirely of survival mode or countdown. It’s fun! But why can’t I pick? Whatever. The game is still frabjous and I love it. Every time Cayde-6 talks, I die. And I will play the campaign repeatedly just to hear him being awesome. Wait. You love ME? ME? OMG. Yes. I can fall in love with an exo. No big. *swoon* And no, I'm not paying for Piclab to get rid of their watermark. I mean! I didn't make this image. 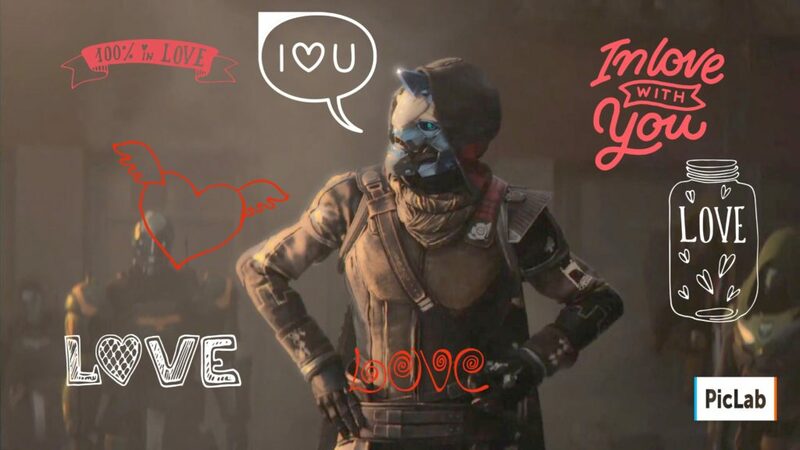 Cayde-6 sent it to me. He's in love with me. He said so. With this picture. That I didn't make. So, will I keep being a devoted fan of Destiny? If they don’t pull a bait-and-switch (like they did with Dinklage, and yes, I usually LOVE [with lots of hearts] Nolan North. But he’s best as not-a-bot, apparently), then I’m in. So. If you play Destiny 2, hit me up. Let’s play some rounds. Comment with your games of choice and/or to join me for a sesh.